At the bottom of the Rue Marx Dormoy, near the La Chapelle Metro station sits Le Capucin. It's the epitome of the banal Parisian cafe, the kind of place where you can still eat hard boiled eggs at the bar. On this morning, my neighbour at the counter is one of the city's street cleaners, his flourescent green plastic broom - matching his uniform - propped up outside at the doorway. The coffee is unsurprisingly tasteless, but it jolts me in to action, and sends me off on my mission. My goal is to find the Croix de l'Evangile, the only remaining such cross in the city (more on these later), but in a thoroughly aimless manner. In a part of the city seemingly without any monuments or points of interest, what would there be to see and discover? Heading northwards on the Rue Marx Dormoy, I am immediately in the territory of the old village of La Chapelle Saint-Denis. Although established sometime in the 6th century, it has always been more a place of passage. This particular road - which later morphs into the Rue de La Chapelle - is an ancient route previously known as l'Estrée, which took people - including the French royal family - between the centre of Paris and the abbey at Saint Denis. The tracing of this path was primarily for practical reasons. Being situated between the hills of Montmartre and Belleville, it offered the easiest route to travellers. But if there are no longer any royal carriages trundling up and down the road, it does still retain its regal aspect. In 1724, Louis XV stipulated that the road should have a width of '18 toises', and a row of trees on either side measuring exactly 18 feet - although these have since disappeared! The other defining aspect of this area are the two railway lines. Scything in from the north and east, they cut La Chapelle into an almost perfect triangle. Even before the village was annexed into the city of Paris (in 1860), these lines had already scarred the landscape in the service of the capital. At the beginning of the Rue Marx Dormoy, these lines - which serve the Gare de Nord and Gare de l'Est - are barely 200 metres apart. I decide to head eastwards, towards the lines serving the Gare de l'Est. I'm not interested in watching the trains roll by, but rather in visiting the new Halle Pajol, a multi-functional building which declares itself to be the largest urban photovoltaic system in France! And it is impressive, even though it is still surrounded by the last traces of construction. The building's shell is an old SNCF workshop bordering the railtracks, but it has been gutted, covered in wooden panels and now sports nearly 2000 solar panels on its roof. At its heart is a youth hostel with over 300 beds, some of which would presumably be ideal for train spotters (or at least those not disturbed by the endless clunking and screeching of passing trains). However, for those wishing to observe the railway landscape there is no need to spend the night. The hostel also houses a cafe with a terrace that looks right out across the tracks. Continuing along the Rue Pajol, my eye is drawn towards a series of figures on a wall. The images are seemingly unrelated, but then I realise that together they form some kind of message. This is an urban rebus, but what is it telling me? A..La..Chat..Pelle...à La Chapelle...what is happening in La Chapelle? Answers in the comments below if you can work it out! Turning left on to the Rue Riquet, then right onto the Rue l'Olive, I am now in one of those environments that the city of Paris would like to promote as a typical street scene. This is the picture-postcard La Chapelle, the centre of a village that no longer exists - or never really existed at all. In the pedestrianised street, tables set up outside food stores are heavy with plump fruit and veg in vibrant colours. Further along, the sun is slanting down onto the terrace of a cafe overlooking the Marché de l'Olive, a typical Baltard-style construction. The multicultural offerings make this quarter even more a magazine-feature ideal for a modern-day city, even if it is far from typical of the district as a whole. Despite the temptations, I don't stop here. I'm looking for something free, and I find it in the nearby Square de la Madone. I'd heard that there was an artesian well in the area, where fresh water gushes out from a table laying over 600m underground, but wasn't sure exactly where it was situated. After asking a passer by I'm guided towards a rather scruffy square and eventually find the curious-looking well head. The water here is naturally low in calcium, and therefore attracts serious tea and coffee drinkers from across the capital. There is one surprise though - the water that comes bubbling out of the tap is close to 30°c! Perhaps unsurprisingly, it also feeds directly into the nearby swimming pool on the Place Hébert. From one virgin to another, I move from the Square de la Madone to the basilique Sainte-Jeanne-d'Arc. This strange - perhaps I should say ugly - structure looks extremely out of place on the Rue de la Chapelle, but it is here for a very specific reason. In August 1429, Jeanne - Joan - set up camp in La Chapelle before an attempt to liberate Paris from its English occupiers. The morning before the assault it is said that she prayed at the Sainte Geneviève chapel that previously stood nearby, and although the attack failed, the local authorities still promised to one day build a monument to Jeanne on the site. It took over 500 years to finally get a structure built in this position, with the idea apparently being to build something that already looked over 500 years old. There can be no other explanation for a facade that is designed to look like a ruined fortification (and that still doesn't explain why there is a wooden shed perched on one of the towers). It is the smaller and much older Saint-Denys de la Chapelle church immediately next door - built on the foundations of the Sainte Geneviève chapel - which should be the destination for Sainte Jeanne pilgrims. Exactly why the overpowering bulky basilique next door was needed is not clear, but if the idea was to build something ostentatious, they could at least have chosen Auguste Perret's project, which included a 200m high tower! Continuing northwards up the Rue de la Chapelle, the environment gets a little more industrial, and the buildings a little taller. This is more typical of the land usage wanted by the local authorities when they decided to annexe the territory into the city of Paris. These largely empty ex-suburbs would soon be filled with everything those living in the centre of Paris didn't want to see - cemeteries, factories, railway sidings - and of course homes for the people who would work in these facilities. For many years, the most visible of these were a series of gasometers, one of which was 65m high and 77m in diameter. Before I arrive on the site of these structures though I am diverted to another wasteland, this time dominated by a massive concrete complex. After passing an empty park in the shadow of edge-of-town high rises, I veer off in the direction of the unmarked. The road opens out into a landscape of desolation, protected somewhat bizarrely by an unmanned guard's hut. Although clearly in a state of abandonment, there is still life here, and it's even possible to play 5-a-side football in one of the old warehouses. If you prefer, you can also simply romp across disused railway tracks and piles of rubble and ask yourself important questions such as why is it always buddleja trees that are the first to grow in urban wastelands? 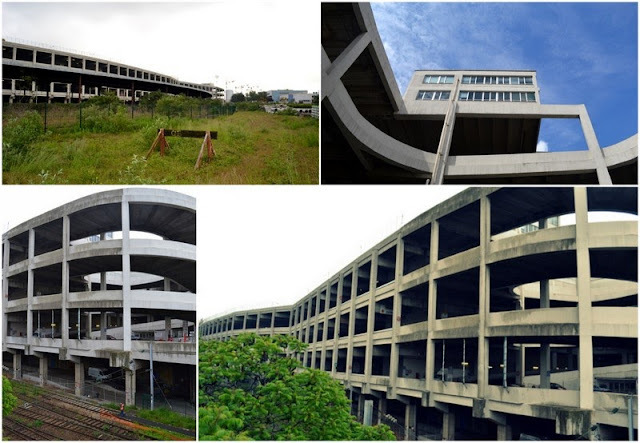 What is most striking though is the structure on the other side of the tracks, a vast car park built in 1976 known as the entrepot Ney. It was built to serve the railway lines that form one side of the La Chapelle triangle, with some - including the old petite ceinture line - passing underneath the building, but the interchange today is almost nonexistant. There is though almost a grace in this netted wall of concrete. Large trucks can be seen winding up the curved lanes at either end, but from across the tracks they look like children's toys. The entrepot Ney is an extension of the even larger entrepot Macdonald which stands alongside in the 19th arrondissement, but if the Macdonald is being converted and regenerated into apartments, shops and schools, the Ney will almost certainly soon be raked to the ground. In the meantime, it seems to have become something of a skating hotspot. Turning round, I find myself on the edge of a zone of anonymous yellow and grey semi-industrial units called Cap 18. This is where the mammoth gasometers once stood, "le vaste quartier des gazomètres dont les hauts et monstrueux caissons semblaient surplomber et écraser la chaussée" as Marcel Aymé wrote in 'Derrière chez Martin'. The gasometers disappeared in 1982, but the district is no less strange and lonely, especially at weekends. This leads down to the Rue de l'Evangile. The cross must be nearby. It is a croix de carrefour, an object placed at the intersection of two or more routes, so must be positioned at the end of the street. And finally, there it is, an almost anonymous figure sheltered by a blanket of trees. Crosses such as these can still be seen all across France, positioned mostly at a fork in the road in small villages and towns, but this is the only one still standing in Paris. Once there must have been hundreds of similar statues, but as the city grew up around them their signification and utility slowly ceased to be relevant. The cross marks a point of hesitation and a choice. As travellers could easily take a wrong direction at these points, the cross was supposed to point out that there was only ever one true direction. This particular cross though has become rather a point to meet and a destination in itself. There are fresh flowers and recently burned candles, the liquid wax staining the plinth, although no-one nearby at this particular moment. The feet of the Jesus statue have also clearly been regularly washed, and shine like a new penny coin. Trains thunder by opposite the cross, out towards the city suburbs. This is the edge of Paris and the end of my journey. All around me are cranes and construction vehicles, reminders that this district is now one of the city's biggest building sites. These roads will not disappear though, and the cross will still survive for many more years, significant for some, invisible to almost all the others. Enjoyed taking this walk with you, through a part of Paris I have not been familiar with before. Also followed Google Street View along the walk, so it gave me a good hour of entertainment. Thanks. Fascinating! i love the idea of a little old Parisien lady coming out once a week to light the candles and polish the feet of Jesus in the middle of all that industrialization. Great to discover the untouristy side of Paris - merci! There is a mystery story or even a thriller just waiting to be written about this place. What a perfect setting! What an interesting walk. Bravo. C'est le cirque à La Chapelle [something "ail"]. Oh ca c'est le pompon.